I HATE CLEANING MY ROOM!!!! I always get in BIG trouble if I don’t clean my room, but I HATE cleaning! It’s THE WORST!! How do you make cleaning fun and easy to do? Oooh boy. If I knew how to make cleaning fun and easy, I’d be rich! Imagine what people would pay for that secret. Housekeepers would have the most fun job in the world and parents wouldn’t have to beg their kids to clean. Kids would think chores were AWESOME. Seriously, though. This is a problem we can all relate to. Well, except for the few among us who genuinely enjoy cleaning. But they are definitely the exception. AND they never let their rooms get messy enough that cleaning it up is a real pain. But most of us don’t mind some mess, and it’s a constant battle with parents who do. I think some parents are worried about hygiene (I mean, it’s probably not great to have moldy things growing under your bed). I think some parents just think everything looks nicer when it’s neat. And, I think some believe you’ll have an easier time staying on top of your schoolwork if your surroundings are organized. 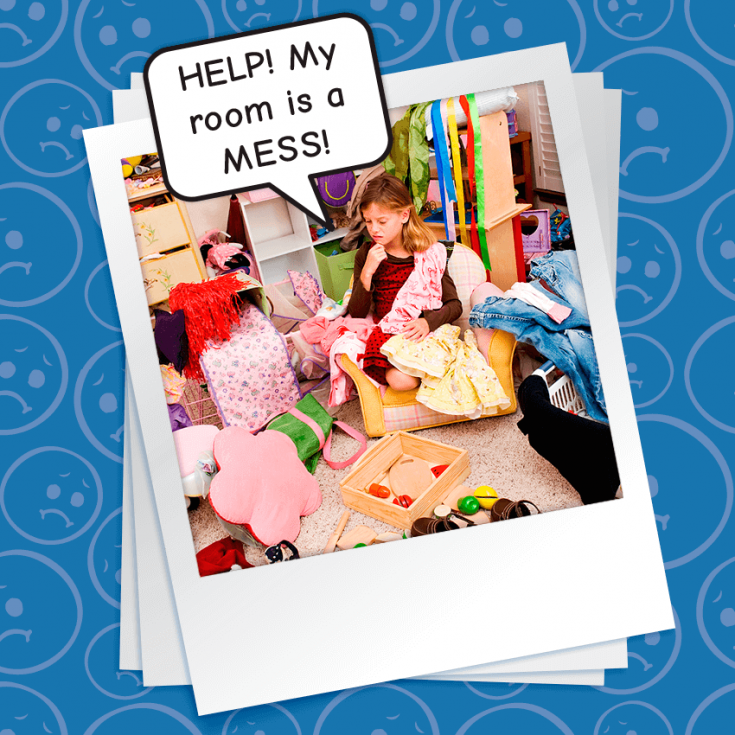 Regardless of your parents’ reasons, you’re getting in trouble for your messy room. So, we have to come up with some solutions on getting it clean and keeping it that way. MUSIC: Listen to really fun, upbeat music while you clean. PRIORITIZE: Start with making your bed, and cleaning things off the floor. There’s more to cleaning your room than just that, but doing those two things will make a HUGE difference in how the room looks. You’ll feel like you’ve accomplished something AND your parents will see that you’re making progress. COMPETE: If you’ve got siblings who also need to clean, you could have a competition to see who can finish first. Your mom or dad might also be willing to compete with you. Can you clean your room before your dad is done washing the car? Or if you’re cleaning on your own, you can try to beat the clock. Can you get all the clothes put away in under five minutes? Can you clean off your desk in under ten? REWARD YOURSELF: Promise yourself a reward for when you’ve finished cleaning. For example, you get to binge watch hilarious YouTube videos or pig out on brownies. You could even get your parents involved and have them treat you to something nice, like some pizza or a trip to the mall. Hey, I’m pretty sure they’ll agree as long as it motivates you to FINALLY clean your room! Once your room is clean, try to KEEP it that way. You could ask your parents for help with this. Have a plan in place and know where everything goes. That way, it’s less likely to end up on the floor or piled up in your closet. How do you guys make cleaning fun? Any tips for KEEPING a room neat, tidy and well-organized? Share your thoughts below! Oh my gosh same. my room is super small(i’m still grateful though) and I share it with my grandma, and whenever it gets a bit messy i am in super stinky trouble. So this really helped me. This happens to me to, and I just give myself a reward, or ask my sister for help and she find a way to make it fun! Don’t mind them, your fine just the way you are. Listening to music always helps me clean my room. I use my imagination, and pretend that I’m digging through bushes for a jewel, but I have to clean! I hate cleaning my room too, but I have to. I listen to music, and my parents reward me by letting me go to my friend’s house, or somewhere special with them. If I don’t clean my room, I don’t go to my friend’s house. And I keep my room clean by making sure that I put whatever I’m using back in the right spot before I grab something else. Awesome. I’m a big pig who can’t EVER clean anything up. Make it a game! that helps me…! yeah, my dad is origanized, but my mom is kinda messy. like, my floor is clean, but my desk is messy. like, SUPER messy! here is my tip: break it into smaller parts. like, one part could be your desk, another could be your closet. does that make sense? I hear ya, dude. CLEANING IS THE WORST! My dad always says I should clean my desk, but that place is a PIGSTY, so I always pass. But I doubt yours is as bad as mine.